This was my first time making stuffed shells. I wanted to make the stuffing a little healthier and more nutritious than the regular cheese stuffing. To do this I added a can of pureed white cannellini beans to the stuffing along with a few other more traditional vegetables. 1. Preheat your oven to 400°F. Bring a large pot of water to a rolling boil and throw the pasta shells into the boiling water. Boil uncovered for 9 minutes. Strain the pasta and lay it out to cool. Separate any pieces that might have stuck together. 2. Chop your spinach an put it in a bowl. Heat some olive oil in a nonstick pan. Add the diced mushrooms tot he pan. Salt the mushrooms so they release their water. Saute them until somewhat browned. Transfer the hot mushrooms over the spinach to wilt the spinach a bit. 3. Now saute your onion and garlic with a little salt and olive oil in the same pan as the spinach. Once the onion is slightly browned transfer it over the spinach as well. 4. Puree a can of white canellini beans. Add the beans to the spinach and mushroom mix. Mix until well combined. Add the ricotta cheese, grated mozzarella, basil, and chives and mix until well combined again. Season to taste. 5. Cover the bottom of your baking pan with a layer of tomato sauce. Generously stuff each shell with the filling and line them side by side in the baking pan. Pour the remaining tomato sauce over the shells. 6. Bake the shells covered at 400°F for 30 minutes. 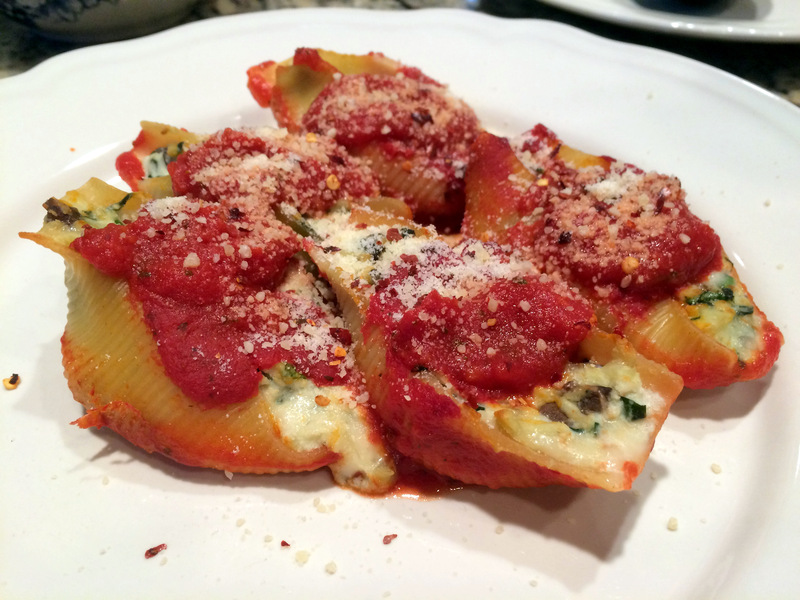 Serve the shells garnished with some grated Parmesan, crushed red pepper and/or fresh basil. This entry was posted on April 28, 2015 by natalyaperullo in Uncategorized.